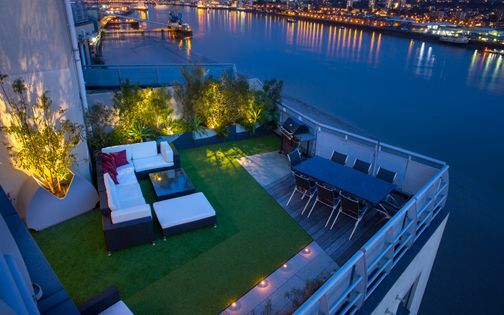 The penthouse suites atop Butlers Wharf, along Shad Thames' riverfront, contain four roof terraces, arranged across a unique two-tiered setting. 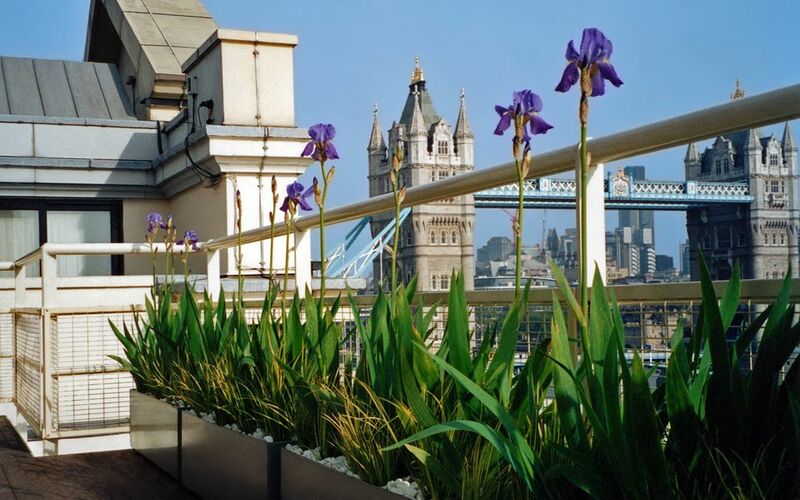 With up-close views of Tower Bridge and Canary Wharf in their north elevation, while secluded and sunny beside the quaint Shad Thames' cobbled pedestrian zone, the roof terraces' landscaping gamut is captivatingly broad. 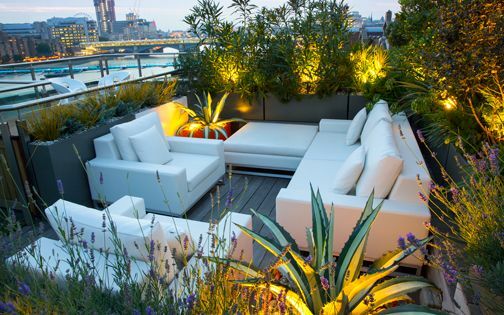 We designed and built a trio of back-to-back penthouse rooftop terrace projects in Butlers Wharf, where lush subtropical foliage, scented Mediterranean nuances and a minimalist spectrum of architectural details narrate multidimensional, intimate and highly functional roof terrace backdrops. 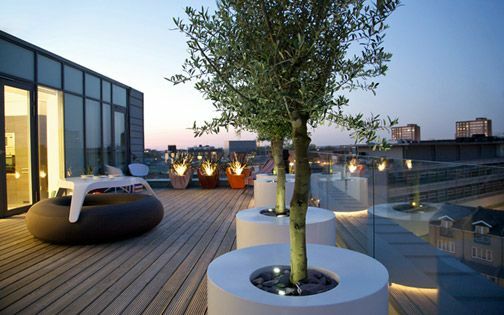 When our clients relocated from Amsterdam to Shad Thames' Butlers wharf, the first item on their wish list was a new landscape design for the apartment's four rooftop terraces. 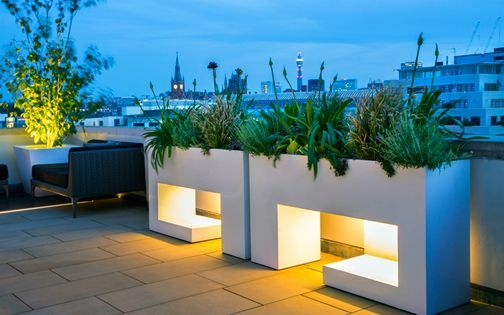 While the outdoor spaces were already furnished with Teak decks and spacious built-in raised beds, we focused on furthering this layout with lush roof terrace designs to invigorate the wharf's minimalist concrete and steel framework. 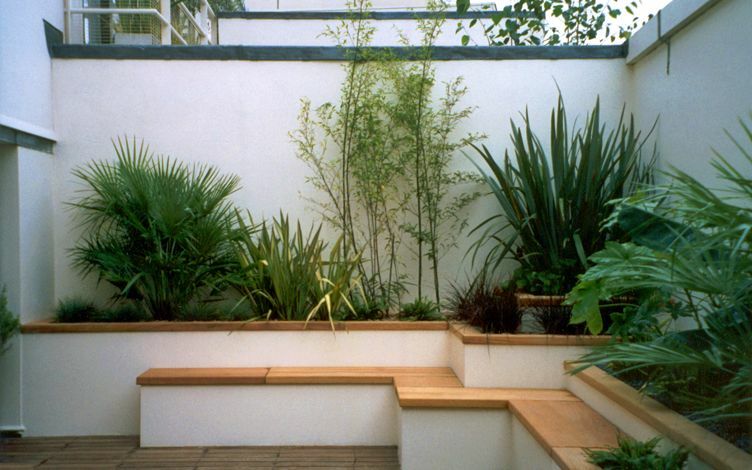 Since Shad Thames' pedestrian zone entails highly restricted works access, we devised a workable timetable to enable a smooth design & build process, and while the neighbours in two adjoining penthouse suites approached us to transform their roof terraces too, the project's scope expanded considerably into a trio of rooftop schemes. 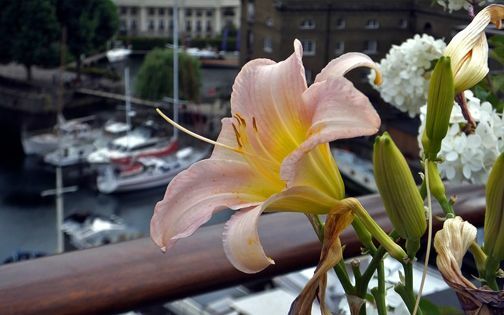 Butlers Wharf's north elevation, at the Tower Bridge end, surveys commanding river views at eye level, and right at its apex, the mid-rise panoramas capture London's skyline, past and present. 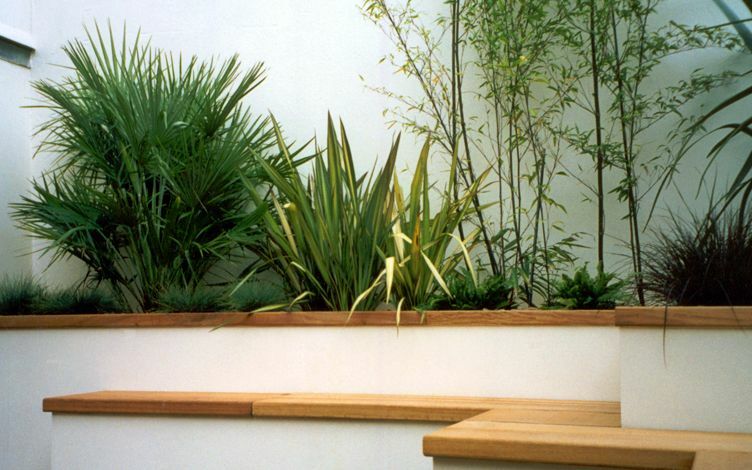 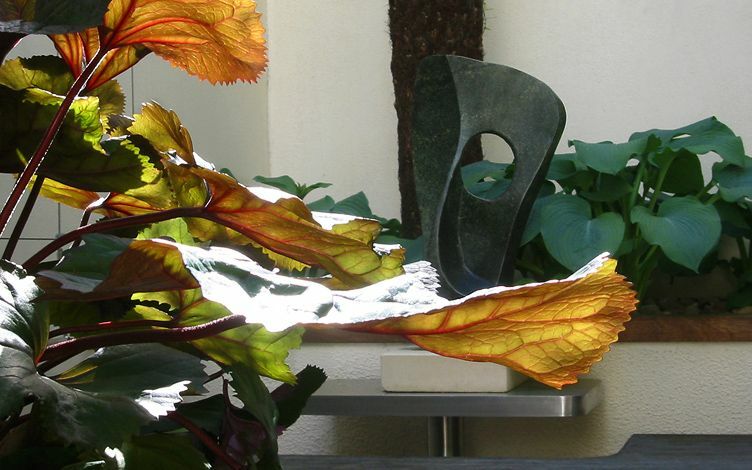 While an upper balcony presents balmy sunrises and sunsets, planted up with Illyrian irises and evergreen Sweet flags, a lower roof terrace benefits from complete seclusion, amid a clement courtyard garden ambience generated by lofty parapet walls – designed as a luscious subtropical atrium. 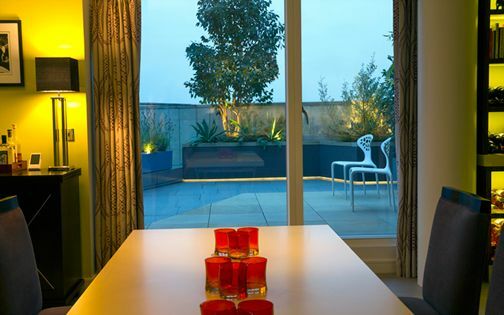 Situated near the master bedroom, this 30-square-metre roof terrace displays a multilayered soft landscape of diverse foliage and architectural scale, alongside an expansive leafy backdrop formed by an evergreen Clematis armandii living wall. 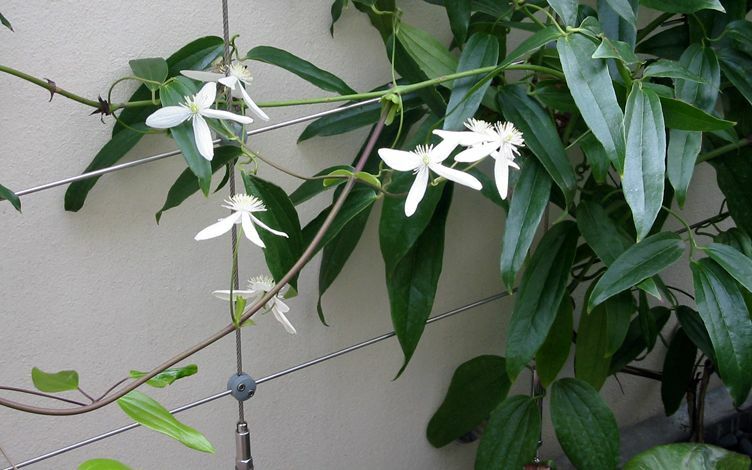 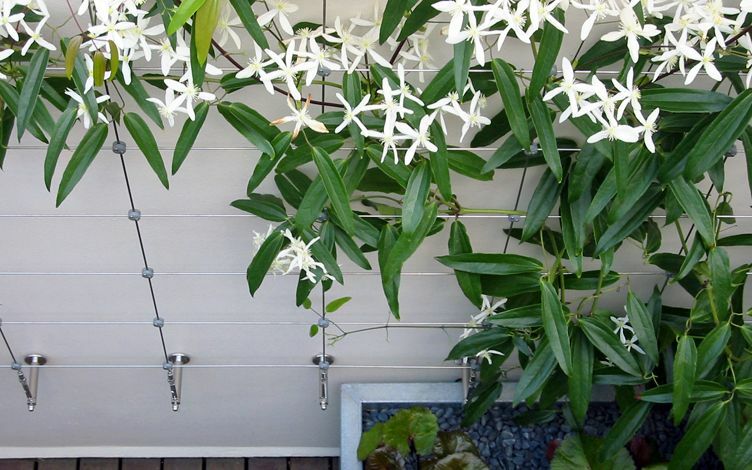 The climbers scramble vigorously over a tall custom-built Jakob stainless steel system, and cascade over the wall into their river setting – producing a matrix of glossy leaves and scented dainty white flowers. 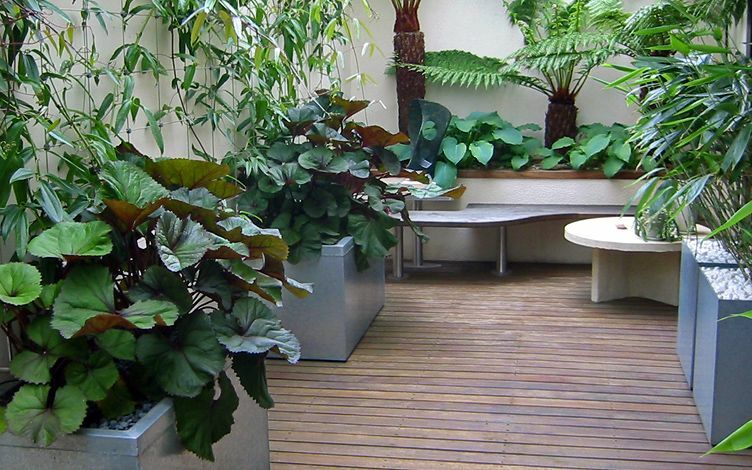 Enfolded by Bamboo, Hosta, Ligularia and statuesque Tasmanian Tree ferns, this robust Clematis sustains a green, thriving roof terrace landscape design. 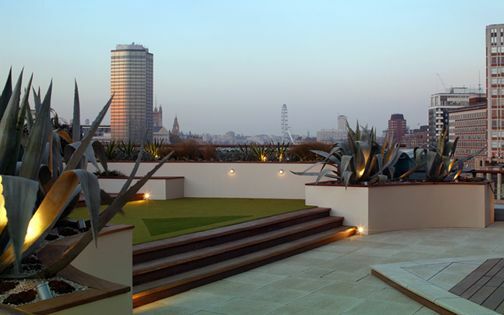 The south-facing roof terraces are equally sized, interlinked within a unique layout. 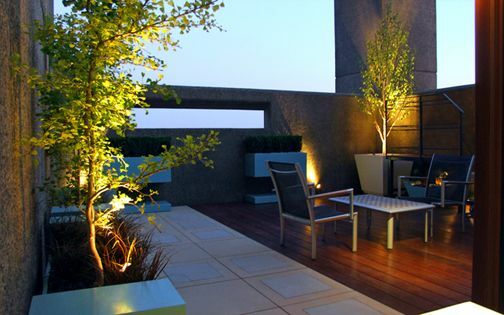 Square in outline, these outdoor spaces are located at the apartment's entrance, with an enclosed lower rooftop adjoining a guests' bedroom below a sunny kitchen roof terrace. 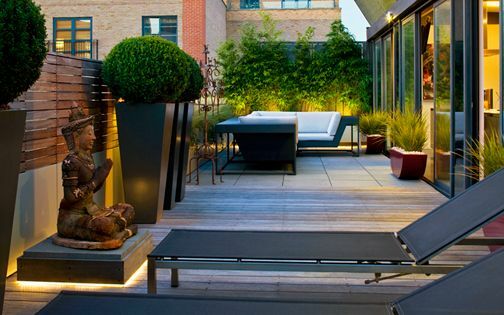 While the shaded rooftop features North American and Asian flora nuances, displaying Silver birch trees, Sword ferns and Fountain grasses, the upper roof terrace sustains Mediterranean overtones with Olive trees, Irises and herbs. 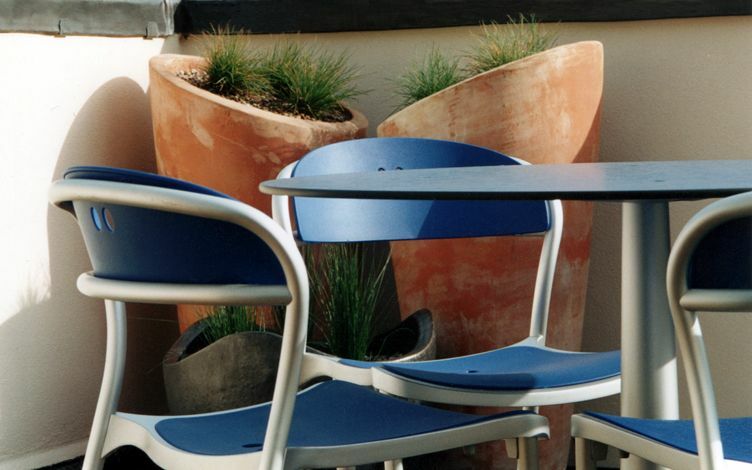 Shad Thames' industrial river characteristics are distilled into a roof terrace design which juxtaposes galvanised steel alongside terracotta urns, concrete and hardwood, where the entrance terrace defines an entire landscape sequence, followed by an aerial vista outside the family kitchen. 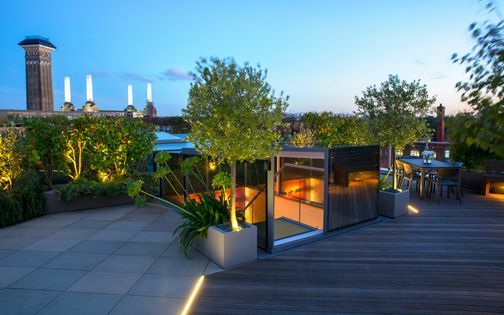 The Silver birch canopies emerge above internal walls to create a scale and texture interplay – connecting these two roof terrace zones rather seamlessly. 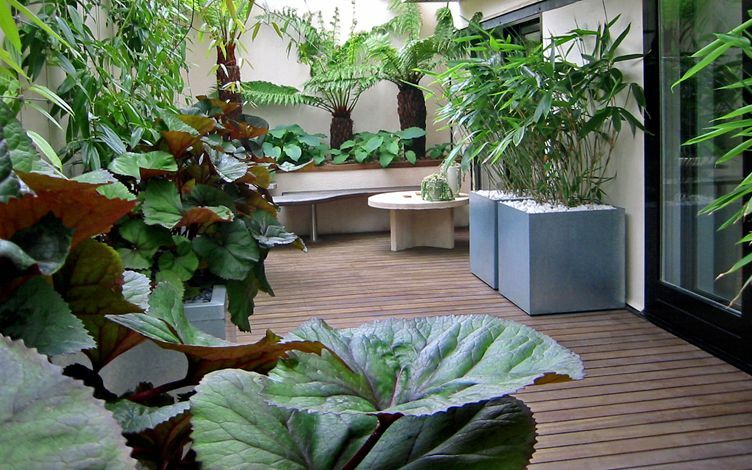 Designing and building roof terrace gardens in Shad Thames forms a continual experience for us, and while immersed in such a culturally diverse, inspiring design centre at the very heart of River Thames, we relish its challenges in creating progressive landscaping schemes – articulated through integral artworks, distinctive geometry, abundant foliage and dynamic architectural focal points. 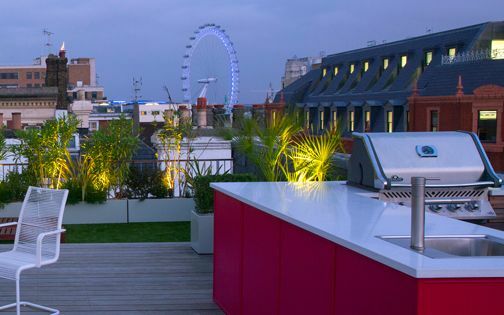 Having known Butlers Wharf's renovation architect, we gained valuable technical insights into the building's structural capacities, and since inheriting a handy framework at the outset, our terrace designs focused on greening up a vast concrete and steel fabric to humanise and soften its scale. 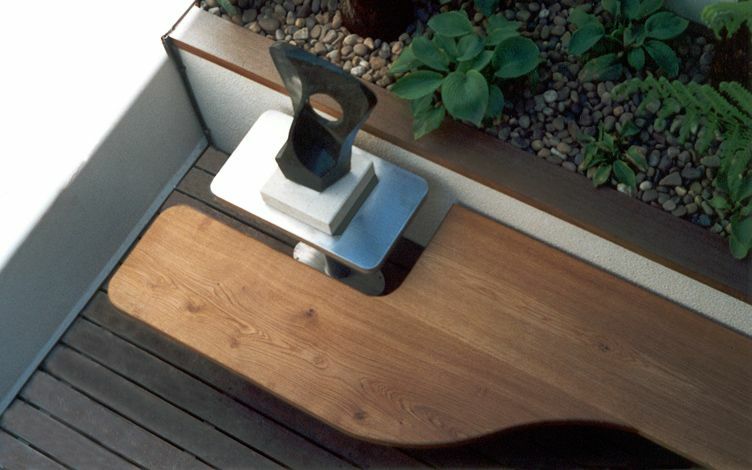 A bespoke curved Welsh oak bench is viewed from an upper balcony, nestled at the lower roof terrace, while enveloping a circular Blanc de Bierges concrete table, accompanying an African opalstone sculpture. 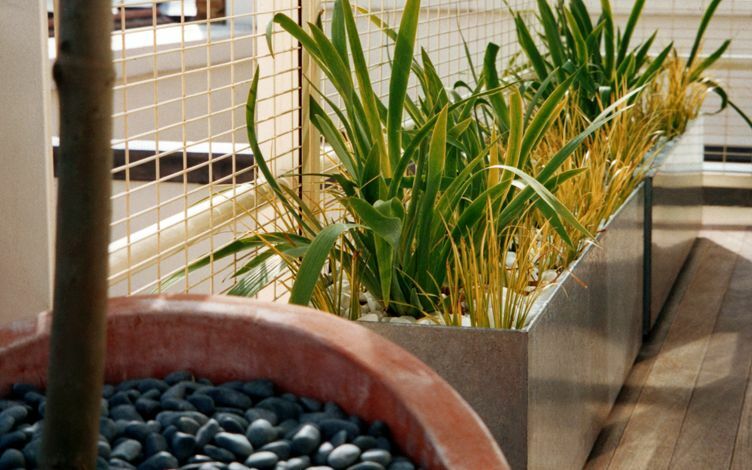 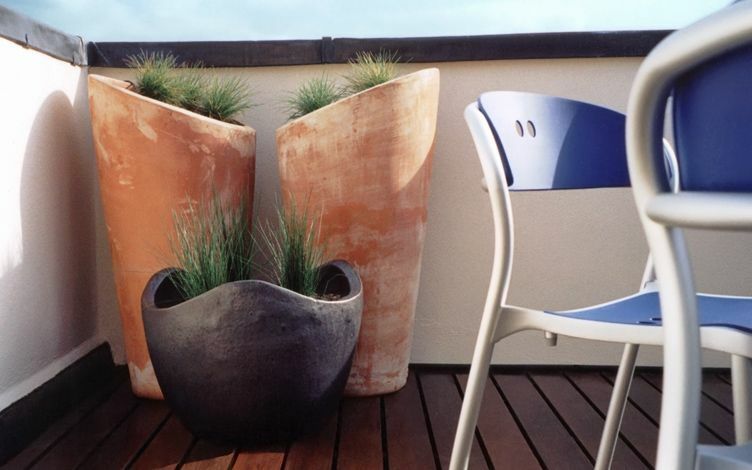 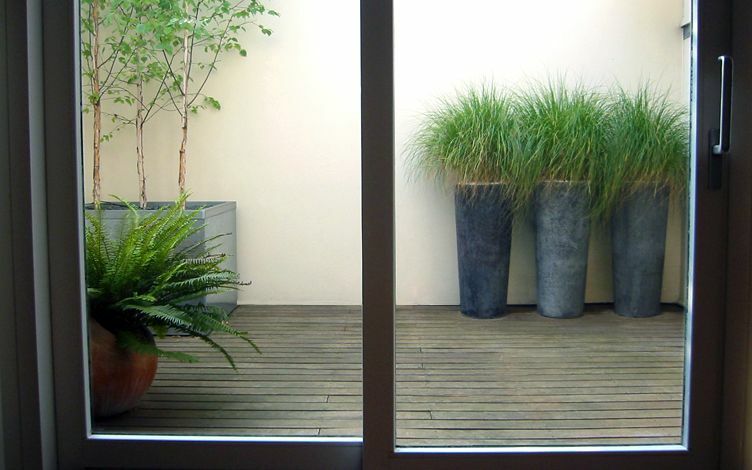 A series of unusual slanting terracotta planters defines the kitchen roof terrace, forming two symmetrical elevations, planted with Blue fescue and Soft rushes. 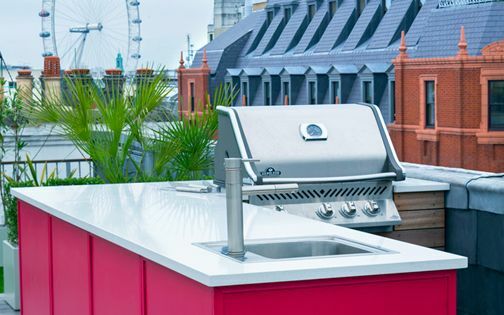 These contrastive material and detail design expressions not only maximise our clients' highly varied roof terrace microclimates, but also sympathetically key into Shad Thames' eclectic, unfailingly absorbing, definitive London riverscape.